Wishbone Ash was formed by West Country musicians Martin Turner and SteveUpton, who arrived in London in 1969 to embark on their musical journey.Intent on creating a musical sound that was rich in texture and melody, MartinTurner envisaged the band’s innovative harmony-guitar hallmark and guitaristsTed Turner and Andy Powell were recruited via a now legendary Melody Makeradvert. The partnership of the original line-up of Wishbone Ash forged a uniquemusical identity that would produce some of rock music's best loved works andinfluence numerous successful bands and result in millions of album sales andconcert attendances. Wishbone Ash would become one of the most enduringand best loved British rock acts and its name synonymous with high qualityguitar-driven melodic rock music. production values being key ingredients in the definitive Wishbone Ash sound.Martin Turner continues to perform the band’s best loved works with hiscurrent line-up, which features guitarists Danny Willson and Misha Nikolic, anddrummer Tim Brown. 2015 saw Martin Turner and his band moving forwards with new original studiomaterial for the critically acclaimed and award-winning Written in the Starsalbum (What’s On magazine ‘Album of the Year’ 2015), which was followed by abusy period of touring during which a live 2CD/DVD The Beauty of Chaos - Liveat the Citadel was recorded in St. Helens for release in Spring 2017. 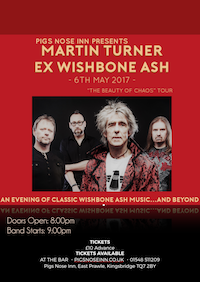 The Beauty of Chaos - Live Dates 2017 tour will feature classic album tracks andstage favourites from the extensive Wishbone Ash repertoire, as well as newmusic that remains true to the original Wishbone Ash blueprint.